Headed back to school time has started! This week's release is perfect for whatever level of achievement your children or you have reached. 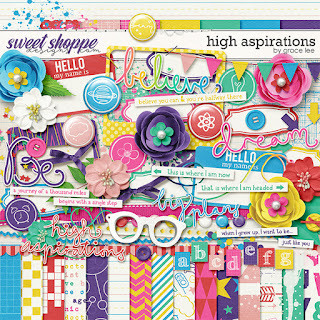 High Aspirations is a bright kit perfect for school and so much more. "What do you want to be when you grow up?" This is one of the questions children get asked most. It's just fun to think up all the possibilities the future holds for us. This is a kit dedicated to all the dreams, hopes and goals we have at different points in our lives. Filled with neon rainbow colors and whimsical doodles, this kit is great for boys and girls, young and old. 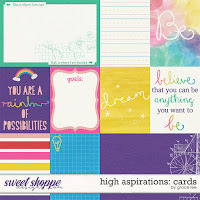 High Aspirations: Bundle includes the kit and the journal cards. All are on sale this week at the Sweet Shoppe!